The ancient city of Petra, situated in modern-day Jordan, prospered for centuries as a major power along the spice route. Once abandoned and forgotten, the dazzling settlement, with tombs, monuments, and temples carved directly into the rock, has been one of the region’s greatest tourist attractions for decades. 1. A TRIBE CALLED THE NABATAEANS BUILT AND RULED PETRA. Not much is known about the people called Nabataeans who emerged in Arabia in the 4th century BCE. Originally nomads who spoke Arabic and later a form of Aramaic, by 100 BCE they had staved off attempted conquests by Demetrius I of Macedonia and the Seleucid Kingdom to become a regional power through their dominance of trade routes between coastal cities and interior settlements. Though they occupied various areas of southern Jordan, Arabia, and the Naqab (or Negev) desert, the Nabataeans made Petra, surrounded by sandstone mountains and cliffs, their capital city. 2. THE ROMAN EMPIRE TOOK OVER IN THE 2ND CENTURY. It is unclear when the Nabataeans built Petra, but by the 1st century BCE, traces of Hellenistic and Roman influence could be seen in art and architecture, including statues of Nike and a Greco-Roman deity named Dushara, a Roman-style theater carved into a mountainside that could seat thousands, and paved streets. Various Nabataean rulers, such as Aretas III and Aretas IV, formed alliances and paid tributes with Rome that shaped the next few centuries, but upon the death of Rabbel II, the last Nabataean king, the city finally came under complete Roman control in 106 CE. 3. THE CITY WAS EVENTUALLY ABANDONED. At the height of the city, 20,000–30,000 people lived and worked in Petra. But the Romans altered the Nabataean trade routes, diverting them away from Petra and using sea-based travel around the Arabian peninsula. (Even earlier, Rabbel II himself likely moved the capital from Petra to Bostra, modern Bosra, circa 93 CE.) A major earthquake in 363 CE destroyed many buildings and homes and decimated the city’s vital water system. As their power waned and another earthquake struck, the Nabataeans ultimately left the city, taking most of their treasures and possessions with them. Outposts built during the Crusades are the last pieces of evidence that the West knew of Petra for half a millennium. Petra takes its name from the Greek πέτρα, which means "stone." And the Nabataeans proved to be especially adept at carving intricate buildings and artwork in their sandstone surroundings. About 3000 homes, temples, tombs, banquet halls, and other dwellings have been documented in Petra, all carved by hand with pickaxes and chisels and built with the support of scaffolding and platforms. Masons typically used a top-down method to work their way down 100-foot cliffs, or sometimes chipped out holes, inserted a piece of wood, and added water to make it swell and crack the rock face. 5. … AND MASTER PLUMBERS. Along with their abilities as traders and stonemasons, the Nabataeans were equally as skilled at channeling clean water to support the city’s population. The surrounding desert provided just 6 inches of rainfall per year, but a collection of local springs, diverted through terracotta pipelines and into cisterns, pumped in up to 12 million gallons of fresh water per day. The city also boasted a large dam that protected the city from floods, and directed the water into a channel called the “Dark Tunnel.” Many Bedu tribes living in the area still use this ancient water-collecting system. 6. 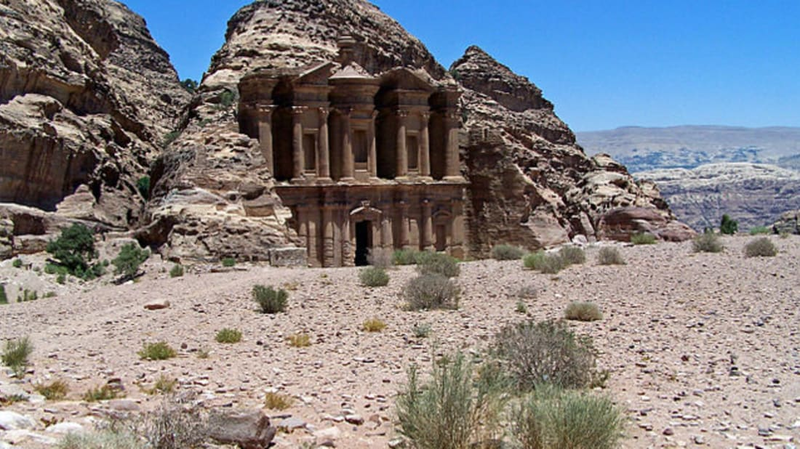 BIBLICAL HISTORY INTERSECTS WITH PETRA. Atop a 4430-foot mountain known as Jabal Harun lies a white-domed mosque built sometime in the 14th century. The mountain is also called Mount Aaron, and the mosque is a tomb to Aaron, a prophet and brother of Moses. Aaron is allegedly buried in the area, and the surrounding valley, called the Valley of Moses, is supposedly where Moses struck a rock and brought forth water, described in the Book of Numbers. 7. A SWISS LINGUIST REDISCOVERED PETRA. Born in 1784, Johann Ludwig Burckhardt traveled extensively throughout the Middle East and Egypt after studying at Cambridge University. While traveling from Syria to Egypt (where he first saw the temples at Abu Simbel), Burckhardt visited Petra and became the first outsider to see Petra, previously unknown and unmapped, in 500 years. (Locals had long been wintering inside the caves.) He published a book in 1822 called Travels in Syria and the Holy Land that described the city, and several thousand Westerners visited the site over the next century, including American painter Fredrick Edwin Church and English artist Edward Lear. The Newdigate Prize is awarded annually to a University of Oxford student poet, and in 1845 John William Burgon won for his work “Petra.” Although he had never ventured to the region, his description of the city in his work as “rosy-red—as if the blush of dawn,” and “a rose-red city—half as old as time” has remained one of the defining descriptors of Petra. 9. IT HAS BEEN A WORLD HERITAGE SITE FOR MORE THAN 30 YEARS. Since 1978 hundreds of cultural and natural treasures around the world have been recognized by UNESCO (United Nations Educational, Scientific and Cultural Organization), and in 1985, Petra was named a World Heritage Site. The organization continues to work with Bedu (a.k.a. Bedouin) tribes to ensure the increased demands of tourism and modernization do not damage local customs and Petra’s sublime beauty. 10. MILLIONS VOTED FOR PETRA AS ONE OF THE “NEW” SEVEN WONDERS. Although partially dismissed as a bit of a publicity stunt, the NewSevenWonders initiative, undertaken from 2000–2007 by Swiss filmmaker Bernard Weber, allowed millions of people around the world to vote for a new crop of the world’s favorite monuments, buildings, and ruins. Along with the Great Wall of China, the Colosseum, Mexico’s Chichen Itza, Christ the Redeemer in Rio de Janeiro, Peru’s Machu Picchu, and India's Taj Mahal, Petra was named one of the winners during a star-studded 2007 event in Lisbon, Portugal. The unscientific polling, supported by the United Nations but not UNESCO, reeled in 100 million votes worldwide via telephone and Internet. 11. INDIANA JONES HEIGHTENED AWARENESS OF PETRA. Before the release of Indiana Jones and the Last Crusade in 1989, just a few thousand tourists visited Petra annually. The filmmakers used the sandstone passageway known as the Siq and the Al Khazna, or the Treasury, as locations for the fictional home of the Holy Grail. Soon Petra was known worldwide, and it became Jordan’s most popular tourist destination, with thousands of people a day trekking to the desert locale every year after the film's release. In recent years, that number has plummeted due to ongoing violence in the Mid-East. A satirical website called the Pan-Arabia Enquirer published a story in 2012 claiming that after holding a naming contest in conjunction with TripAdvisor, the Jordanian Tourism Authority had renamed Petra “That Place From Indiana Jones"—a shortened version of the original winning name: "That Place From Indiana Jones And The Last Crusade, You Know, The One With The Old Dude And The Magic Cup." Out of financial considerations for local hotels that would have to redo their signs, Pan-Arabia Enquirer joked, the tourism authority went with the abridged name. 12. SATELLITE IMAGERY RECENTLY REVEALED A NEW DISCOVERY. Using Google Earth, drones, and the satellites WorldView-1 and WorldView-2, archaeologists Sarah Parcak and Christopher Tuttle studied Petra and the surrounding area and recently revealed the outlines of a previously unknown monument not far from the city center. Parcak and Tuttle described the structure as an open platform roughly the length of an Olympic swimming pool, twice as wide, with a slightly smaller platform, columns, a small building and a large staircase. The structure is believed to have been used for public ceremonies and was likely built by the Nabataeans during the middle of the 2nd century BCE.